For over 20 years, NITRO-TECH has been a leading protein brand. Built on a foundation of human research and cutting-edge science, it has earned the trust of countless consumers worldwide. Now the researchers at Team MuscleTech are proud to present a new formula based completely on rapid-absorbing whey peptides and high-purity whey isolates. Introducing NITRO-TECH WHEY + ISOLATE GOLD - a whey peptides and isolate formula that's micro-filtered to remove more carbs, fat and lactose while retaining more BCAAs, aminos and glutamine! Whey protein peptides and isolate provides your body with the highest biological value (BV) protein fractions. BV is a measure of how much of a protein's amino acids your body absorbs and retains - the higher the value, the more musclebuilding potential. This is why NITRO-TECH WHEY + ISOLATE GOLD uses only ultra-pure, micro-filtered whey protein peptides and isolate. 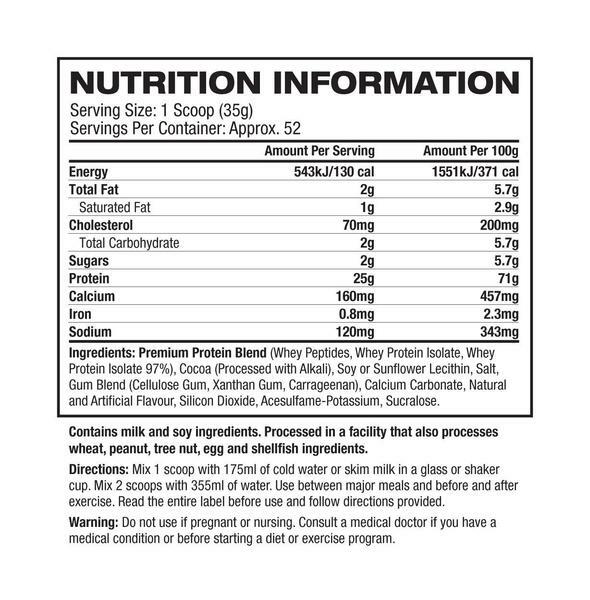 Each two-scoop serving delivers 50g of protein, 11.2g of naturally occurring BCAAs, and 8.2g of glutamine and precursor to help build lean muscle and promote recovery. Whey peptides are a powerful amino acid containing components derived from much longer whole whey protein molecules. Whey peptides can promote muscle recovery from exercise. What's more, whey peptides have one of the highest biological values (BV) of any protein source, a value given to protein sources to measure how well they are absorbed and used by the body. Each delicious scoop of protein also delivers a complete spectrum of musclebuilding amino acids - includiing high levels of all nine essential amino acids. NITRO-TECH WHEY + ISOLATE GOLD is not just loaded with musclebuilding protein, it's also loaded with taste! Team MuscleTech researchers partnered with some of the world's leading food scientists to deliver truly mouthwatering flavors you'll love to indulge in! We're confident you'll love these incredibly delicious new flavors! To ensure a high standard of quality and purity, the whey protein in NITRO-TECH WHEY + ISOLATE GOLD has been filtered using Multi-Phase Filtration Technology, and each batch NITRO-TECH WHEY + ISOLATE GOLD also undergoes strict quality control and is third-party tested and verified to ensure that each bottle meets the highest standards of purity, quality and consistency.